Whether you’re interested in selling your home in the near future or are simply wanting to make some improvements to make your home more enjoyable, there’s a good chance that you’re considering residential remodeling in Maryland. However, if you’re going to be spending your hard-earned money on remodeling your home, don’t you want to enjoy the greatest return on investment (ROI) in the process? If so, then there are a few specific remodeling projects that you may want to consider–especially if you’re looking to sell. Most buyers these days tend to place updated kitchen and bathroom spaces as a top priority when looking at homes. Therefore, if you have an outdated kitchen, you’ll have a hard time selling unless you spend some money on updating it. 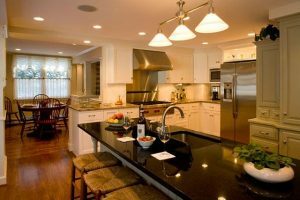 Whether it be a minor renovation, such as refinishing the cabinets and installing new hardware, or something more drastic like a total kitchen remodel (including new appliances, flooring, countertops, and more), kitchen renovations tend to have the greatest returns on investment of all the residential remodeling options out there. In addition to kitchen spaces, today’s buyers want luxurious and upgraded bathroom spaces (especially in master bathrooms). So if you have an outdated bathroom, now is the time to consider replacing the flooring with something more modern, installing a new vanity, and perhaps even retiling that old shower/tub combo (or even replacing it with a luxurious walk-in shower). To really wow potential buyers and achieve that luxury spa-like getaway, consider add-ons like heated floors and even a heated towel rack. These days, bigger is better when it comes to home size. The more bedrooms and bathrooms a home has, the more it’s worth. So if you’ve been considering a home addition, now is a great time to make it happen. Whether you’re looking to add more square footage to your master bedroom or would even like to add an entirely new bedroom, den, office, or bathroom, a home addition project can help you make that happen. Generally, the more bedrooms and bathroom your home has available, the higher the value of your home. The same goes with living space; if you have a small living room, consider adding onto it or even adding a separate family room or den space that potential buyers will fall in love with. Another fun option to consider is that of adding a game room. If you currently have an unfinished basement, then you have a lot of untapped potential in your home–especially when it comes to living space and square footage. After all, did you know that an unfinished basement typically doesn’t count towards your square footage in a home real estate listing? If you finish the space, however, it can be counted and can also be a huge selling point to potential buyers. Whether you decide to add bedrooms, a living area, or even a bar, a finished basement is a great way to make the most of the space in your home without having to add onto its footprint. Last but not least, transforming your living space so that it has an open floor plan can also be a great way to add value to your home. Today’s buyers are all about the open floor plan, so knocking down walls that separate your living, dining, and kitchen spaces can make a huge difference. Just be sure to work with a professional when knocking down walls to ensure that they aren’t load-bearing and, if they are, that proper support beams can be installed. Looking for more information or help with your next home remodeling project? Feel free to contact us today!